The Democratic Primary is next Tuesday, May 19th. Philadelphia Democrats will select the candidate virtually certain to become our next Mayor. Of the 6 in the running, Jim Kenney rises to the top, both in our opinion and in recent polls. The next most likely contender is Anthony Hardy Williams who has close ties to outside millionaires intent on the privatization of our schools as well as th e Marcellus Shale Coalition, which employs his wife and has contributed to his campaign. Williams has also refused to distance himself from anti-Muslim extremists. We believe that Williams is divisive and toxic to Philadelphia, but that he has a serious chance of winning if the vote is split between Kenney and other candidates with progressive politics. This would be tragic for Philadelphia in many ways, and would mark a turning from the green agenda of the Nutter administration backwards toward a 19th century vision of pollution, economic stagnation and accelerating climate catastrophe. There has been some concern expressed in environmental circles about the presence of Phil Rinaldi, CEO of Philadelphia Energy Solutions, on Jim’s Policy Committee. We also were concerned about this and asked for a meeting with Jim and his policy chief, which turned out to be extremely productive. Our team of representatives from interfaith groups, environmental groups, labor & business, all opposed to the dirty energy hub, new pipelines, dangerous oil trains, and fracking, found Kenney most willing to listen to us as we educated him and his team about the moral issues around climate change as well as the value of green investment over fossil fuel investment in creating jobs without sacrificing clean air, clean water and clean food. Dr. Poune Saberi practices as an occupational & environmental medicine physician, and serves on the boards of Physicians for Social Responsibility. Professor Kenneth Lande has taught at the University of Pennsylvania since 1959. 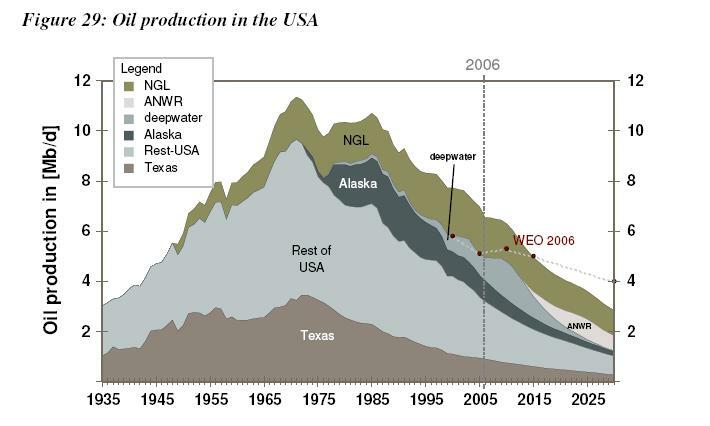 He is one of the most prestigious physicists in the US and is known for his extensive research on the impact of fossil fuel extraction and use on health, safety and the environment. Dianne Herrin is a green development champion with training and experience with LEED Operations and Maintenance, carbon accounting/reporting, municipal energy planning, energy master planning, and has ISO 50001 certification. These three advocates will be at the table when energy and economic development decisions are made in the Kenney administration. In addition, the Kenney policy team included substantial input from us into a new energy policy for Philadelphia. We’re delighted with the result, which includes a goal of 80% carbon reduction by 2050. With three world-class policy advisors with extensive policy background on his team, Kenney actually has the expertise and experience at his disposal to move on concrete, doable steps toward this goal. The policy doesn’t just talk about carbon reduction. It lays out specific policy to reduce building energy use, to reduce the emissions from the City fleet, to implement a green (and local) procurement program, to incentivize renewable energy, to encourage more green roof infrastructure, and more! We believe this puts Kenney head and shoulders above the rest of the candidates, even those who claim to support green development but don’t put forward specific plans and still maintain that a fossil fuel hub can be achieved without environmental sacrifice. A week before our crucial meeting with Jim and his team, GRID magazine endorsed Nelson Diaz for Mayor. Many of us were disappointed to see this from a local magazine educating our region on sustainability, but found it understandable because Kenney’s new appointments and policy had not become public. Now, there is no reason not to feel GREAT leaving the voting booth, not wasting a vote on a candidate who can’t win, but propelling a true champion into office. Last we heard, Diaz only had 4% at the polls. This primary could be won by a narrow margin, so remember that voting for Diaz is taking a vote from Kenney, and handing it to Anthony Williams, the corporate candidate, financed by the fracking industry, school privatizers and anti-Muslim voices. We could continue wringing our hands and complaining about inaction on climate and corruption from our politicians. Or we can engage in conversation with them, and make this the Climate Change election it ought to be. A few more points about Jim Kenney: He’s local, born, educated and lived all his life in Philly, and committed to all of its residents. Our local paper, the Inquirer, wrote this about him on May 7th: “Kenney called passionate, loyal to a fault, driven to do right.” Earlier, on May 3rd, a Philadelphia Magazine article, The (New) Jim Kenney for Mayor, explained his evolution from an impassioned young man to a seasoned politician. rights, to marijuana reform, to immigration reform. And now, to dealing with climate disruption in our region. 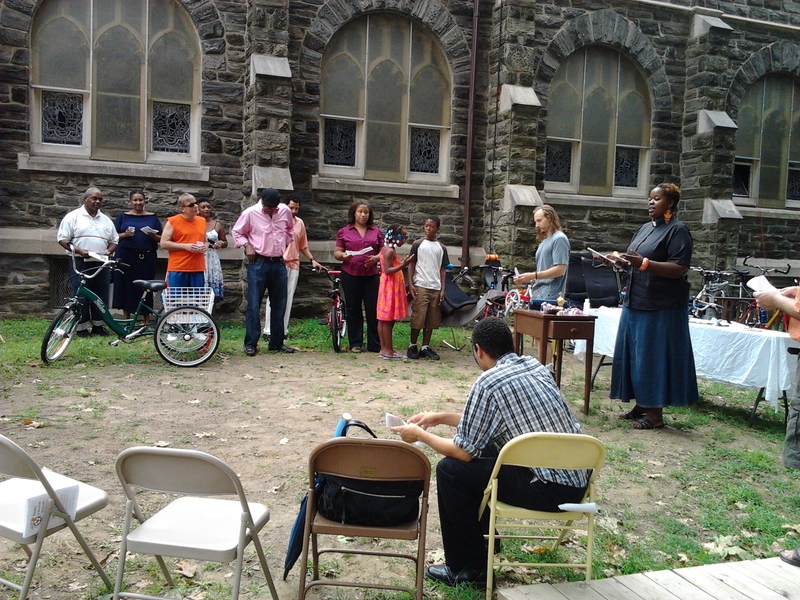 Rev Aisha, pastor at Mt Airy Presbyterian Church, led the region’s First Annual Blessing of the Bikes yesterday. Blessing of the Bikes is an event that originated at the Cathedral of St John the Divine in New York City in 1999, traveled to Baldwin Michigan, and discovered by Brent of the Mt Airy Presbyterian Church. A full history of this event can be found here. Present in a world groaning under the excesses of consumption, we acknowledged the simple beauty of the bicycle. Present in the community of beautiful diversity, we asked for protection and blessing on all who ride: pedi cabbies, weekend warriors, athletes, students, children, eco-warriors, anarchists, bike messengers and all others who take to the streets of Philadelphia. A beautiful morning indeed as cyclists pedal into their week. 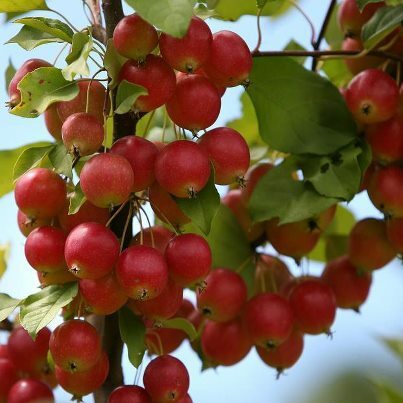 Gardens—floral & food, critters—ground hogs & squirrels, sheet mulching and fruit tree possibilities. 3’x6’ kids/kitchen raised box gardens are being dreamed up for late March. We feasted on 17 delectable dishes and connected in the dead of winter looking toward the spring. 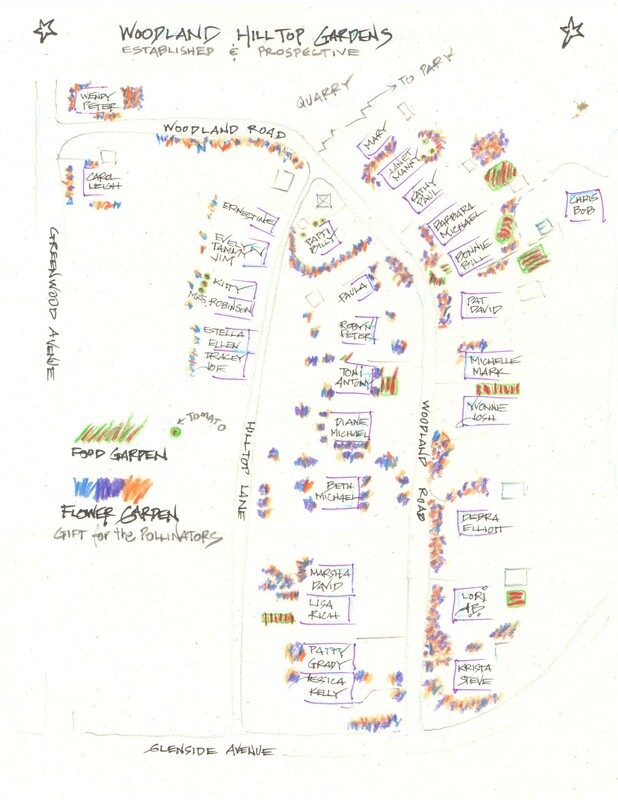 Here is an “aerial” map showing the established and projected gardens of our Woodland Hilltop “village”. Last night over dinner with the clan, the conversation turned to the price of gasoline, with recent news projecting that it’ll reach $4 by April and $5 by the end of May. While the bike shop owners amongst us rejoiced, one of the adults made a reference to peak oil by mentioning that this was inevitable, since we’re bound to run out of oil. Cory Suter, a member of Transition Philadelphia and founder of BioNeighbors, has dreamt up a new project: Direct Congress. Direct Congress is the next evolution of human achievement in good governance, where We the People can direct our Congress by creating the best laws possible, and supporting candidates who contractually agree to only vote the way the majority of citizens vote online. Direct Congress is a model built on both American principles and the Guiding Principles of the Transition movement. As Chief Steward of Direct Congress, Cory suggests we visit directcongress.org to share our thoughts on how to improve this concept. I particularly like the financial transparency they share on the Records page. Please note that Cory is also asking for some funds to get this web-based project fully functional; making it all that the American people need it to be. History-making is indeed in our hands! They have plans to provide free local versions of the Direct Town Council, a micro version of Direct Congress to communities who want to make local government more democratic and accountable to the people. 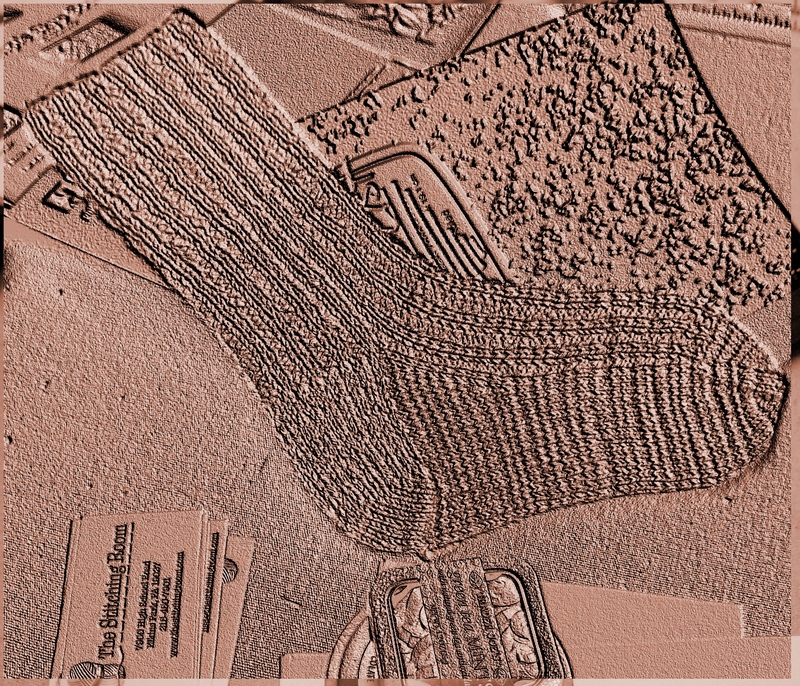 I always feel vulnerable in the winter–nothing is growing out there and what if the furnace should quit–what then!! The truth is, though, I’m vulnerable all year long and so are my neighbors. Cheap energy has encouraged us to buy at a bargain everything we need. 98% of the American population depends on the 2% to grow the food we all need. The hand-made world has gone away. The problem is that cheap energy is now going away too. The cheap energy has made our climate more intense and now that cheap energy is going away, our economic and social systems will become more intense. I would like to see if its possible to bring back the Home Made World. 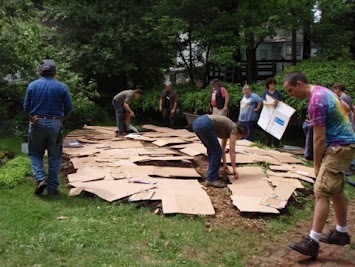 Is it possible to mobilize our neighborhood to re-skill–to teach each other and learn what our great grandparents knew: How to grow, gather, preserve, cook, repair, reuse, recycle, mend, create and construct? Since it’s 2012 and the Mayan Calendar quits this year, I thought it would be a good year to see if we the neighbors of Woodland Rd. and Hilltop Lane could create as my neighbor Diane puts it–a village that can provide for its own needs. Martin Luther King Day of Service would be a good day to do a survey of the skills on our street. My Transition Philly friend, Meenal, loaned me her copies of: The Transition Companion (the latest Transition Towns manual) and the November/December WellBeing issue of Resurgence magazine. Out of these publications I arrived at 11 skill sets of the Hand-Made World and drew up a survey to find out who knows what. After emailing 15 neighbors, about this experiment, I showed my wife, Bonnie, the survey that I had sent out and she said it was a mistake–“you’re coming off like a “Know It All”. Ai Yi Yi–I hate Know It Alls! I quickly called the 15 neighbors and no one had even looked at the email. So I framed up the idea over the phone with my neighbors or their message machines and drew up another survey–this one more folksy and hopefully a lot less preachy. The 2nd Survey can be found by clicking this link. Everyone is within walking distance. There are 21 homes on my street, Woodland, 6 households on the adjoining street, Hilltop Lane and 9 more homes that back onto Woodland or have a buddy that I wanted to include–36 in all. I hand delivered the flyer to all 36 in 40 minutes. I’m discovering that to get people’s attention in the 21st century it’s necessary to email, call, and with most visit face to face. It’s winter and I need to get everyone’s phone and email, fortunately I already know where they live. On Sunday afternoon, I went out to fill in the phone numbers I didn’t have. As I talked to the neighbors I caught at home, an idea came out that we would have a series of Re-Skilling House Parties–maybe one a month. Perhaps the first in February will be The Famous Party for Planning Your Garden…to include all ages. So far there are 7 families who are interested. I still have phone follow-up with 20 households to see what they think of the Re-Skilling idea and to ask for their email addresses if they are willing. and I’m highlighting The Stitching Room as a local business relevant to Transition Philadelphia. The Stitching Room is in the center of Elkins Park and is owned by Lisa Stockebrand, also from Elkins Park. The Stitching Room is a project workshop. It serves as a community resource for project material, tools & equipment, education & classes, and working space. Walking through the door into this space, my senses came alive to the diverse materials and activities of craft. There are sewing machines, ironing boards, spinning wheels, a library, work tables, dye pots, seductive yarns, locally crafted buttons, a variety of inspiring projects in process, a comfy sofa and chairs, and countless tools of the trade. I, instinctively, reach out to a brightly colored bulky woolly sweater and barge into a conversation. “Tell me about the sweater!” This old beloved sweater was damaged by moths and Lisa is treating and mending it. She knows how! No one sits behind a counter in The Stitching Room. My initiation to this space was a workshop called Socks with Sara, in which Sara introduced me to the use of circular needles borrowed from the shop. I use yarn that was spun and dyed by Lisa’s Union Street Fiber. Lisa plays DJ while she irons pieces for another project and Sara knits to stay a teaching step ahead of me. We are sharing information about dyes and fibers and stories about family and chickens. This working space is, absolutely, delicious! I look forward to taking my project to work on during the free Neighborhood Knit Night next Thursday which will give me a chance to ask for help if I need it and to spend time getting to know the people in my community. According to Transition USA, “the Transition movement is comprised of vibrant, grassroots community initiatives that seek to build community resilience in the face of such challenges as peak oil, climate change and the economic crisis.” Though the Stitching Room is not, formally, connected to the Transition movement; it is working to build a resilient community in a very organic and real way. There are two things about the Stitching Room that strike me as being relevant to our Transition efforts. First, the Regenerative Design Institute states, “In this modern culture, most of us have lost the skills of basic craftsmanship. As we transition away from global consumerism and towards localized, earth-friendly economies, we need to reclaim these skills for ourselves and for our community.” The Stitching Room helps our community, directly, through re-skilling around the Fiber Arts. Secondly, when we grow or craft our own products; we begin to understand the value and nature of the objects and materials that we interact with every day. We begin to ask questions. Where did it come from? Who made it? How did they do it? How long did it take? With our own hands engaged; we become connected and we begin to care. The Stitching Room also has a Facebook page and for the Philadelphians reading this, right by the Elkins Park station on SEPTA’s Warminster & West Trenton Regional Rail lines.